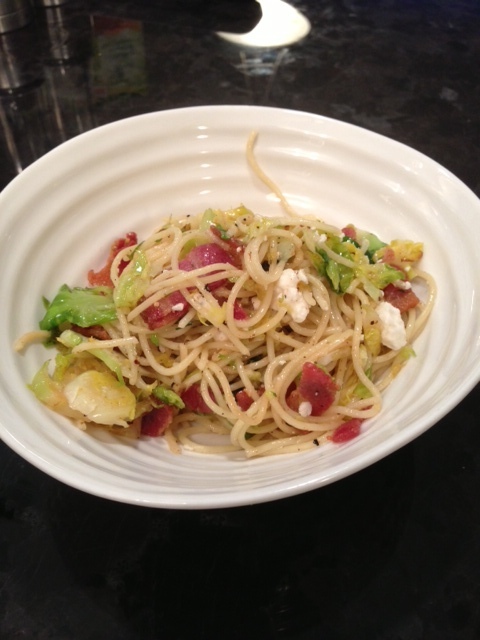 Pasta with Bacon, Brussels Sprouts and Feta | So Hungary! We don’t often eat pasta in our house, and there is a reason for that – Pat and I will devour a 6 person serving of pasta between the two of us! Every once in a while we do like to indulge in a delicious pasta though, and this new recipe we tried is a new favourite! We only started eating Brussels Sprouts this past year, and we have been missing out! This delicious vegetable is very versatile, and we now enjoy it on a weekly basis. There are so many ways to cook it, and the way it is done in this pasta is something new to us. It is also a great way to hide the fact you are putting Brussels sprouts in something, especially if you have kids or picky eaters around. Thinly slice the Brussels sprouts with a sharp knife and set aside. You can also use the shredding attachment of your food processor. I am currently terrified of my knives because I had a knife incident with my thumb this past month, and now I make Pat chop everything for me! In a large pot of salty water, cook the pasta to al dente, or according to the package directions. When straining your pasta, reserve about 1/3 cup of the pasta water and put aside for later. Put a large heavy skillet on medium-high heat and add your bacon. You do not need to add any oil or butter as the bacon has enough fat already. Once your bacon has crisped up, remove the pieces with a slotted spoon and set them to the side. Leave all the yummy drippings in the pan! Your pan and bacon fat will be very hot, so remove it from the heat for about 3 minutes to cool off. Place the pan back on the heat, and add your sliced Brussels sprouts. Cook them for 5-7 minutes, stirring occasionally. When they are soft and starting to turn golden, season with salt and pepper and turn the heat off. Add the cooked pasta and cream to your pan. Toss to combine. Add some of your reserved pasta cooking water now to give your pasta a light and silky coating. Add your cooked bacon and crumbled feta to the pan and remove from the heat. Using a pair of tongs works best to really toss the pasta well, and ensure that every bite will have all the delicious ingredients included. Season with salt and pepper, and serve immediately! This meal is very quick to prepare and cook, and a great option if you are in a rush! I hope you enjoy this dish as much as we did, and maybe you will have better will-power than we did and not eat too much!